The Norwich Terrier dog is a somewhat rare breed developed in the early nineteenth century that started out as a ratting dog to be reckoned with. The sire credited for the first mating was a dog named Rags from the town of Norwich in the East Anglian region of England. He was a working terrier with well-honed rodent destroying skills. Various terriers were used in the breeding stock - most likely Cairns and Borders. As time went on, the Norwich Terrier's skills were extended to the hunting of fox and badger, a job he took on with a great amount of zeal! The Norwich is a very attractive, hardy breed with awesome abilities considering that among the terrier dog breeds, he is one of the smallest of the working terriers! It is hard to imagine such tenacity in such a small dog! He was recognized by the AKC in 1936. In its appearance, the Norwich Terrier dog breed is very similar to, and shares its history with, the Norfolk Terrier. Both dogs were reared for the same working purposes. They were separated into two different breeds in 1964, though it is hard to tell them apart except for the carriage of their ears. Both are very lovable little dogs. The Norwich is a loyal, fearless and bold terrier with an amiable demeanor. He is very sociable and gets along well with everyone. He is also very intelligent and has an active mind. Training needs to be firm yet kind, with the rules being consistent. Like many small terriers, this breed does have the earth dog tendency to dig. Barking can become a problem if they become bored. It is best not to leave them unattended for too long and to secure property lines to discourage burrowing. He is reputed to be a good watchdog. Ideal height of the Norwich is up to 10 inches with a weight between 11-12 pounds. Coat color variations are Red, Wheaten, Black/Tan and Grizzle. The double coat of the Norwich Terrier dog is hard and wiry with the undercoat being very thick. While shedding is minimal, frequent brushing and combing is needed to remove loose hair and keep the coat in good condition. To maintain the natural coat, it should be hand stripped with a special tool, designed for the purpose, about twice a year. If not being entered in dog shows, the coat can be clippered instead, but the texture will change. The Norwich are susceptible to skin allergies resulting in itchy skin, which can lead to hot spots as well as bacterial skin issues. How Active is the Norwich Terrier Dog? They were bred for an active life and are still extremely energetic dogs. Although they are not demanding of a walking schedule, they should get enough exercise to keep them out of mischief. However, its high energy could benefit from an outside area to run around. 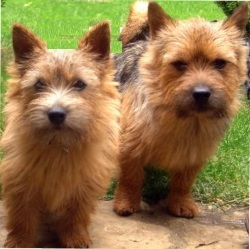 Children are naturally attracted to the Norwich Terrier and the dog has a very good reputation with older children. The caution always remains that it is wise to supervise playtime, even with the most trusted breeds. Does the Norwich Terrier do Well With Seniors? This little dog couldn't help but be an enjoyable and cheery companion for seniors or sedetary families. He is a very affectionate dog and does best when someone is home most of the time to keep him out of mischief! Given the right amount of exercise and mental stimulation, the Norwich is quite easy to look after. Covers breed history, characteristics, puppy selection, feeding, training, health care issues and behavior. Also includes advice about puppy-proofing the home, preparing for the puppy, housetraining and potential puppy problems. Extensive selection of color photos. The very latest information on the care of small dogs, as well as the safest, and fastest training methods for little dogs. Includes the very important topics of housetraining to house manners. I understand that you will use my information to send me Spoiled Dogs Newsletter.